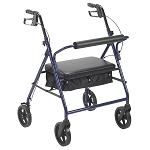 The Go-Lite Bariatric Rollator by Drive Medical comes in an attractive blue finish. 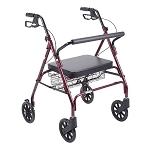 It is constructed from a strong, steel reinforced frame that supports 500 lbs. 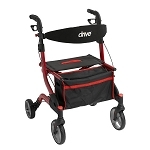 and comes standard with a large, comfortable, soft padded, oversized seat with a large basket that is mounted underneath. The basket easily and securely transports personal items. The large, 8" caster wheels are ideal for indoor and outdoor use ensuring a smooth ride over most surfaces. 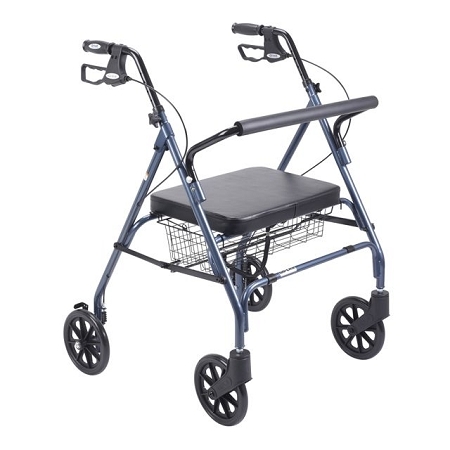 Actual Product Weight: 26 lbs; Casters: 8"; Handle Height (Max): 39.5"; Handle Height (Min): 35.25"; Number of Wheels: 4; Overall Product Height: 35.25"; Overall Product Length: 26.75"; Overall Product Width: 30.5"; Primary Product Color: Blue; Primary Product Material: Aluminum; Product Weight Capacity: 500 lbs; Seat Depth: 13"; Seat Width: 18"; Seat to Floor Height: 22"